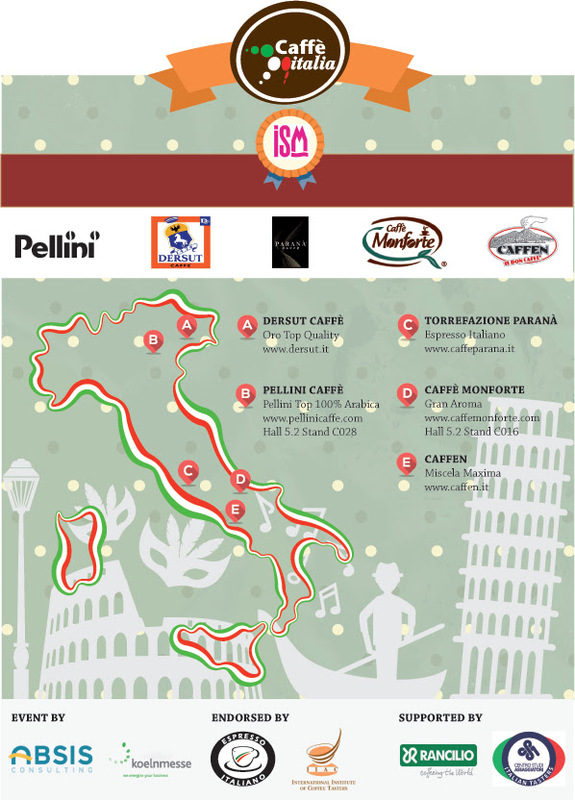 The Ism 2016 in Cologne (Germany, 31st January – 3rd February) will host seminars by the International Institute of Coffee Tasters (Iiac) on tasting Italian espresso. Carlo Odello, member of the board and lecturer of the Iiac, will host the seminars twice a day at Caffè Italia, the special area focused on Italian espresso. Caffè Italia is also endorsed by the Italian Espresso National Institute (Inei). The seminar program is available here. The International Institute of Coffee Tasters (Iiac), which for over twenty years has dedicated its work to the tasting of Italian espresso coffee, actively collaborating in the promotion of this product with the Italian Espresso National Institute, has now strengthened its presence in Asia with the opening of two new branches in Korea and Taiwan. Over the past two years, the educational and promotional campaigns of the Institute in these two countries has seen significant growth in the numbers of local tasters. This area now boasts an impressive number of 38 Espresso Italiano Trainers, instructors with the task of promoting the culture of Italian espresso coffee through ongoing and varied educational activities. Alongside these figures, there are the Italian instructors who regularly hold sensory analysis courses in Seoul and Taichung. “The creation of these branches in Korea and Taiwan will provide these two countries with more organisational autonomy, and represents another step forward for our work – commented Luigi Odello, Chairman of Iiac – These two new branches can now be added to the Japanese branch in Tokyo, now active for six years, thereby reinforcing the network that in Asia alone has nearly 700 tasters, many of whom have now reached advanced training levels”. Espresso Italiano Roasting, the new publication from the International Institute of Coffee Tasters, has just been published. It is completely focused on the Italian way of roasting and blending. Italian espresso stands out as a concrete expression of the elegance typical of “Made in Italy”, products covering the key role of testimonial of our agro-food culture. And this is why science can only resort to all the modern available means to photograph this art, hoping to replicate and innovate it. And the aim of Espresso Italiano Roasting is all about this, in fact it focuses on collecting and arranging the output of coffee research using appropriate technical terms to promote its diffusion, giving special attention to the current available means in the field of coffee roasting. As a matter of fact, each single chapter and paragraph is soaked in sensory analysis, which is the main tool used at present for selecting green coffee, setting the roasting process and realizing the blends. The countless correlations involving chemistry, technology and sensory results will easily guide the readers, giving them the tools to understand phenomena they have certainly already observed in the past without the necessary competence. Espresso Italiano Roasting is in fact based on the experience that the author has achieved with the courses held by the International Institute of Coffee Tasters, the thousands of consumer and laboratory tests carried out by the Taster Study Centre and the tens of samples that have undergone sophisticated chemical analysis. Espresso Italiano Roasting is only available in electronic format (high resolution PDF) and can be ordered on the website of the International Institute of Coffee Tasters. The index and the first chapter are freely downloadable from the same website. Everything is ready for the kick-off of the International Institute of Coffee Tasters – Japan. It will be opened up on the 28th of April in Tokyo. To celebrate the occasion, on the 26-27th of April two new licence courses have been organised to satisfy the continually increasing demand for training on coffee tasting. The courses will be held in Osaka and Tokyo, as in the past. The new tasters will join the large number of tasters already operational in Japan thanks to the excellent coordination job done by Yumiko Momoi and her staff. Brazil also will have its own International Institute of Coffee Tasters. The founding of an association with the same aims of its parent association and which will apply the very same methods seems to be a symbolic undertaking in the country which give us so much precious raw material for the Italian Espresso. While the Japanese market dates back to some years ago, the Brazilian market is opening up just now to the Espresso: an association of coffee tasters has a pioneering spirit to it. Also the market in the Balkans is opening up and growing. Where the must was drinking Turkish coffee, nowadays, in the dregs of that beverage, it is possible to read the future of the espresso in the Balkans. In March, the International Institute of Coffee Tasters has been invited by Grand Kafa – the biggest roaster, comprising Serbia, Romania and Bulgaria, in the region – to give coaching at a licence course and a course for Espresso Italiano Specialist at its new training centre. This is a collaboration with the most challenging training scheme in the Balkans and a cooperation which will position the International Institute of Coffee Tasters and its method as the quality standard for this region.